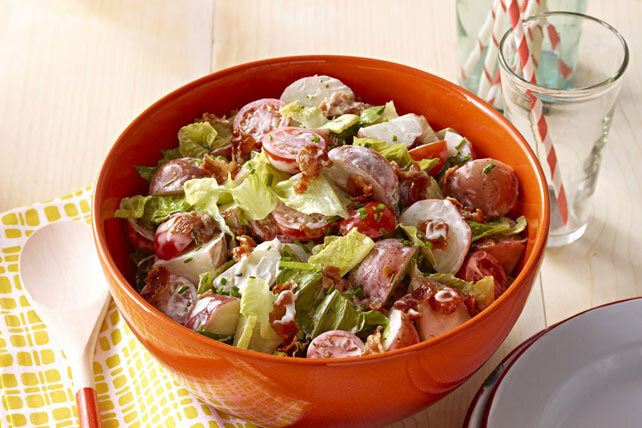 Our awesome potato salad features an unbeatable combo of tender potatoes, crispy bacon and juicy cherry tomatoes. Place potatoes in 2-qt. microwaveable casserole. Add water; cover with lid. Microwave on HIGH 6 to 8 min. or just until potatoes are tender; stir. Let stand, covered, 5 min. Drain potatoes; rinse with cold water. Drain again. Mix mayo, chives and vinegar in large bowl until blended. Add potatoes and remaining ingredients; toss to coat. Prepare salad as directed, except omit the lettuce. Refrigerate up to 24 hours. Toss with lettuce just before serving.